Max Theodore Felix von Laue (Pfaffendorf, near Koblenz, October 9, 1879 – April 24, 1960 in Berlin) was a German physicist. He demonstrated that X-rays were electromagnetic waves by showing that they produce a diffraction pattern when they pass through a crystal, similar to the pattern light exhibits when it passes through a diffraction grating. For this discovery, he was awarded the Nobel prize in 1914. He resisted the policies of Nazi Germany during World War II, although he worked under the regime throughout the course of the war. Max von Laue was born in Pfaffendorf, near Koblenz, in what was then Prussia, the son of Julius von Laue, a military official who was raised to the rank of baron. Von Laue's father traveled quite a bit, the result being that he had a somewhat nomadic childhood. It was while he attended a protestant school in Strassburg that his interest in science began to blossom. He was particularly drawn to study of optics, and more particularly, to the wave theory of light. In 1898, after passing his Abitur in Strassburg, Laue entered his compulsory year of military service, after which he began his studies in mathematics, physics, and chemistry, in 1899, at the University of Strasbourg, the Georg-August University of Göttingen, and the Ludwig Maximilians University of Munich (LMU). At Göttingen, he was greatly influenced by the physicists Woldemar Voigt and Max Abraham and the mathematician David Hilbert. After only one semester at Munich, he went to the Friedrich-Wilhelms-University of Berlin (Today: Humboldt University of Berlin), in 1902. There, he studied under Max Planck, who gave birth to the quantum theory revolution on 14 December 1900, when he delivered his famous paper before the Deutsche Physikalische Gesellschaft. At Berlin, Laue attended lectures by Otto Lummer on heat radiation and interference spectroscopy, the influence of which can be seen in Laue’s dissertation on interference phenomena in plane-parallel plates, for which he received his doctorate in 1903. Thereafter, Laue spent 1903 to 1905 at Göttingen. Laue completed his Habilitation  in 1906 under Arnold Sommerfeld at LMU. In 1906, Laue became a Privatdozent in Berlin and an assistant to Planck. He also met Albert Einstein for the first time; they became friends and von Laue went on to contribute to the acceptance and development of Einstein’s theory of relativity. Laue continued as assistant to Planck until 1909. In Berlin, he worked on the application of entropy to radiation fields and on the thermodynamic significance of the coherence of light waves. While he was still a Privatdozent at LMU, von Laue married Magdalene Degen. The couple had two children. From 1909 to 1912, he was a Privatdozent at the Institute for Theoretical Physics, under Arnold Sommerfeld, at LMU. During the 1911 Christmas recess and in January 1912, Paul Peter Ewald was finishing the writing of his doctoral thesis under Sommerfeld. It was on a walk through English Garden in Munich in January, that Ewald told von Laue about his thesis topic. The wavelengths of concern to Ewald were in the visible region of the spectrum and hence much larger than the spacing between the resonators in Ewald’s crystal model. Von Laue seemed distracted and wanted to know what would be the effect if much smaller wavelengths were considered. He already knew that the wavelength of x-rays had been estimated, and that it was less than the estimated spacing of the atom lattices in crystals. This would make crystals a perfect tool to study the diffraction of x-rays. He arranged, with some resistance, to have the experiment performed by Paul Knipping and Walter Friedrich in which a beam of x-rays was directed toward a crystal of copper sulfate. The pattern that this made on photographic film was consistent with diffraction patterns when visible light is passed through much wider gratings. 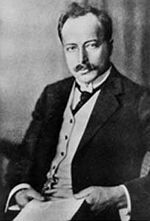 In June, Sommerfeld reported to the Physikalische Gesellschaft of Göttingen on the successful diffraction of x-rays by von Laue, Knipping and Friedrich at LMU, for which von Laue would be awarded the Nobel Prize in Physics in 1914. The exact arrangement of atoms in a variety of crystals, a question that Laue had not been able to completely solve, was soon thereafter elucidated by William and Lawrence Bragg with the help of X-ray diffraction. This father-and-son team received the Nobel prize for their efforts in 1915. 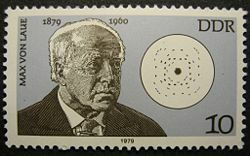 In 1912, Laue was called to the University of Zurich as an extraordinarius professor of physics. In 1913, his father was raised to the ranks of hereditary nobility; Laue then became von Laue. As a consultant to the Physikalisch-Technische Reichsanstalt (Today: Physikalisch-Technische Bundesanstalt), von Laue met Walther Meissner who was working there on superconductivity, the tendancy of materials to conduct electricity with little resistance at very low temperatures. Von Laue showed in 1932 that the threshold of the applied magnetic field which destroys superconductivity varies with the shape of the body. Von Laue published a total of 12 papers and a book on superconductivity. One of the papers was co-authored with Fritz London and his brother Heinz. Meissner published a biography on von Laue in 1960. Johannes Stark, who received the Nobel Prize in Physics in 1919 and who had attempted to become the Führer of German physics, was a proponent of Deutsche Physik. Against the unanimous advice of those consulted, Stark was appointed President of the Physikalisch-Technische Reichsanstalt in May 1933. However, von Laue successfully blocked Stark’s regular membership in the Preußische Akademie der Wissenschaften. Haber received the Nobel Prize in Chemistry in 1918. In spite of this and his many other contributions to Germany, he was compelled to emigrate from Germany as a result of the Law for the Restoration of the Professional Civil Service, which removed Jews from their jobs. Von Laue’s obituary note praising Haber and comparing his forced emigration to the expulsion of Themistocles from Athens was a direct affront to the policies of National Socialism. In connection with Haber, Planck and von Laue organized a commemoration event held in Dahlem-Berlin on 29 January 1935, the first anniversary of Haber’s death – attendance at the event by professors in the civil service had been expressly forbidden by the government. While many scientific and technical personnel were represented at the memorial by their wives, von Laue and Wolfgang Heubner were the only two professors to attend. This was yet another blatant demonstration of von Laue’s opposition to National Socialism. The date of the first anniversary of Haber’s death was also one day before the second anniversary of National Socialism seizing power in Germany, thus further increasing the affront given by holding the event. On April 23, 1945, French troops entered Hechingen, followed the next day by a contingent of Operation Alsos – an operation to investigate the German nuclear energy effort, seize equipment, and prevent German scientists from being captured by the Russians. The scientific advisor to the Operation was the Dutch-American physicist Samuel Goudsmit, who, adorned with a steel helmet, appeared at von Laue’s home. Von Laue was taken into custody and taken to Huntington, England and interned at Farm Hall, with other scientists thought to be involved in nuclear research and development. While incarcerated, von Laue was a reminder to the other detainees that one could survive the Nazi reign without having “compromised”; this alienated him from others being detained. During his incarceration, von Laue wrote a paper on the absorption of X-rays under the interference conditions, and it was later published in Acta Crystallographica. On 2 October 1945, von Laue, Otto Hahn, and Werner Heisenberg, were taken to meet with Henry Hallett Dale, president of the Royal Society, and other members of the Society. There, von Laue was invited to attend the 9 November 1945 Royal Society meeting in memory of the German physicist Wilhelm Conrad Röntgen, who discovered X-rays; permission was, however, not forthcoming from the military authorities detaining von Laue. In July 1946, von Laue went back to England, only four months after having been interned there, to attend an international conference on crystallography. This was a distinct honor, as he was the only German invited to attend. He was extended many courtesies by the British officer who escorted him there and back, and a well-known English crystallographer as his host; von Laue was even allowed to wander around London on his own free will. 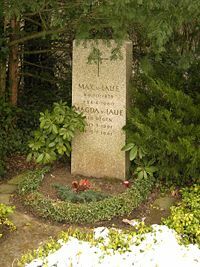 Max von Laue's gravesite in Göttingen. On April 8, 1960, while driving to his laboratory, von Laue’s car was struck by a motor cyclist, who had received his license only two days earlier. The cyclist was killed and von Laue’s car was overturned. Von Laue died from his injuries sixteen days later on April 24. Von Laue was prescient enough to realize that crystals could be used to diffract X-rays in much the same way that light waves are diffracted by optical gratings. This simple observation, when properly investigated, led to the opening of the new field of X-ray crystallography. The techniques pioneered by von Laue and perfected by the Braggs led to important discoveries, such as the unraveling of the helical structure of deoxyribonucleic acid (DNA) in the 1950s. Von Laue helped to show by example that one can be a positive influence in a political regime that is bent on destructive policies, such as was Hitler's Germany in the 1930s and 1940s. Von Laue's role in opposing Nazi plans to dominate German science allowed him greater freedom than other German scientists to pursue his work after World War II. 1925 - 1933 – Advisor to the Physikalisch-Technische Reichsanstalt (Today: Physikalisch-Technische Bundesanstalt). Von Laue had been sacked in 1933 from his advisory position by Johannes Stark, Nobel Prize recipient and President of the Physikalisch-Technische Reichsanstalt, in retribution for von Laue’s open opposition to the Nazis by blocking Stark’s regular membership in the Preußische Akademie der Wissenschaften. Memberships in the Russian Academy of Sciences, the Kant Society, the Academy of Sciences of Vienna, the American Physical Society, the American Physical Society, the Société Française de Physique and the Société Française de Mineralogie et Crystallographie. Corresponding Member of the Academies of Sciences of Göttingen, Munich, Turin, Stockholm, Rome (Papal), Madrid, the Academia dei Lincei of Rome, and the Royal Society of London. ↑ B. L. van der Waerden (ed. ), Sources of Quantum Mechanics (Dover, 1968), 1. ↑ Max Planck, Zur Theorie des Gesetzes der Energieverteilung im Normalspektrum, Verhandlungen der Deutschen Physikalische Gesellschaft 2 237-245 (1900) as cited in Hans Kango (ed.) and translated by D. ter Haar and Stephen G. Bush Planck’s Original Papers in Quantum Physics: German and English Edition (Taylor and Francis, 1972), 60. ↑ 3.0 3.1 Max von Laue – Mathematics Genealogy Project. Max von Laue, Ph.D., Universität Berlin, 1903, Dissertation title: Über die Interferenzerscheinungen an planparallelen Platten. Retrieved September 26, 2016. ↑ 6.00 6.01 6.02 6.03 6.04 6.05 6.06 6.07 6.08 6.09 6.10 6.11 6.12 6.13 Max von Laue – Nobel Prize Biography. Retrieved September 26, 2016. ↑ 7.0 7.1 7.2 7.3 7.4 7.5 7.6 7.7 7.8 7.9 Hentschel, 1996, Appendix F, see entry for Max von Laue. ↑ 8.0 8.1 8.2 8.3 8.4 8.5 8.6 8.7 Max von Laue Biography – Deutsches Historisches Museum Berlin. Retrieved September 26, 2016. ↑ Ewald 50 Years of X-Ray Diffraction Chapter 4, 37-42. ↑ Jungnickel, Volume 2, 1990, 284-285. ↑ 12.0 12.1 12.2 12.3 12.4 12.5 12.6 12.7 12.8 Max von Laue, My Development as a Physicist Retrieved September 26, 2016. ↑ Walther Meißner, Max von Laue als Wissenschaftler und Mensch (Verl. d. Bayer. Akademie d. Wissenschaften, 1960) and (C. H. Beck Verlag, 1986). ↑ Max von Laue Naturwissenschaften 22 97 (1934). ↑ Hentschel, 1996, Document #29, 76-78: See Footnote #3. ↑ Hentsche, 1996, Document #120, 400-402: A letter from Lise Meitner to Otto Hahn. ↑ Walker, 1995, 65 – 122. ↑ Heilbron, 1996, 159-162 and 167-168. ↑ Beyerchen, 1977, 64-69 and 208-209. ↑ Bernstein, 2001, pp. 333-334. ↑ Hentschel, 1996, Appendix A, see entries on KWG and KWIP. Herneck, Friedrich. Max von Laue. Leipzig: Teubner, 1979. Jammer, Max. The Conceptual Development of Quantum Mechanics. New York: McGraw-Hill, 1966.
van der Waerden, B. L. (ed.). Sources of Quantum Mechanics. Dover, 1968. Max von Laue Biography – Deutsches Historisches Museum Berlin. Max von Laue - Nobel Prize Biography. Nobel Lecture Address - Max von Laue Concerning the Detection of X-ray Interferences, November 12, 1915. Nobel Presentation Address - An account of von Laue's work is by Professor G. Granqvist, Chairman of the Nobel Committee for Physics. History of "Max von Laue"
This page was last modified on 6 September 2018, at 20:28.